As part of properly maintaining your CPAP mask, one of the things that all manufacturers recommend you do is clean your mask daily. To this point, I’ve been taking apart my mask and washing it out with warm water and baby shampoo then letting it air dry. This has been really effective and is the recommended solution you see most online. 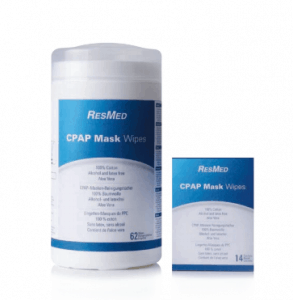 I’d read about the CPAP mask wipes before but my CPAP supplier didn’t carry them, but on a recent visit, they mentioned that they’d just gotten the ResMed CPAP Mask Wipes in stock. I couldn’t pass up the opportunity to try them out. The wipes themselves are 100% cotton, so they’re natural and non-abrasive so they’re very gentle on the mask. They are also entirely alcohol and latex free, which is an absolute requirement to ensure that the silicone on your mask doesn’t breakdown. One thing I was a bit worried about was the smell the wipes would leave on my mask, but these particular wipes are scentless. I had found on occasion that if I didn’t rinse my mask out really well, I would sometimes smell and even get a slight taste in my mouth of baby shampoo which could be really unpleasant, but with these Resmed Mask Wipes, I’ve never had anything like that. The wipes also contain aloe vera which is great for your skin. Considering the issue I had previously with CPAP mask rash, this touch of aloe vera is something I’m quite happy about. When I wake up in the morning and take my mask off, I pull one of the wipes out of the container, take my mask off its frame and give is a really good wipe down, paying particular attention to the silicone seal. It takes about 30 seconds all up and then I just snap the mask back into the frame and get on with my day. A little side benefit is how well designed the actual dispenser for the wipes is. If you’ve ever had small children, you’re probably familiar with the wet wipe dispensers where you pull them out one at a time and the perforated sheets come apart one by one. Those things are a giant pain and more often than not you end up pulling out multiple wipes or like eight of them get stuck in the hole! I’m happy to report that ResMed have figured this out and they have this sort of dual action dispenser where you pull the next sheet out through a wider hole and then pull it against this other part that has teeth to catch it, hold the next sheet in place and makes it easier to tear the sheet you want apart along the perforation. I haven’t explained this really well, but I was very excited by it – Johnson & Johnson should take note! The last point I’d like to add is that these CPAP Mask Wipes don’t replace the cleaning instructions you’ve gotten from your mask’s manufacturer, they aid in keeping your mask extra clean and well maintained. You should follow whatever instructions your mask’s manufacturer recommends. I’ve told my CPAP supplier that I want them to keep stocking this item. For a mere $12, you get 62 cleaning sheets which is great value. Apparently, I’m not the only one who thinks so because my provider got a whole shipment of them and sold out in a couple days – thankfully they’d put mine aside for me! If you’re using a CPAP mask, these handy little ResMed CPAP Mask Wipes are a fantastic little investment.